The Dutch class 5000 was originally conceived by the War Department in the UK about halfway WW2. In general the so-called Austerity classes were conceived to serve the war effort with a minimum of resources in terms of production time, materials used and maintenance effort. 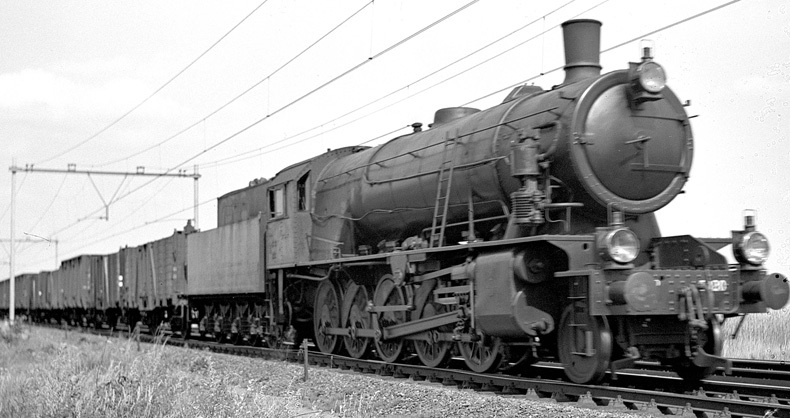 The 2-10-0 was a further development of the 2-8-0 which on its turn was based on LMS class 8F. The modifications to the 8F design were made by R.A. Riddles, since 1939 Director of Transportation Equipment of the Ministry of Supply, and former assistant of the 8F's designer William Stanier. 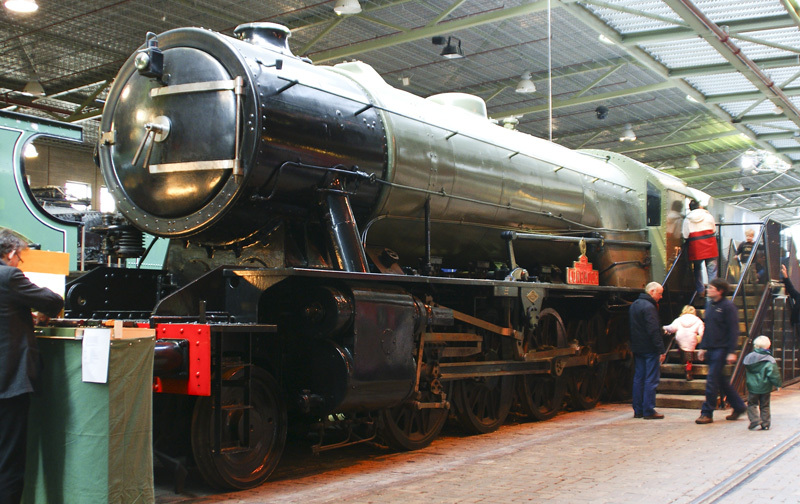 Riddles woudld design the British Standard locomotive classes after the war, from which the 9F can be seen as the peacetime version of the WD 2-10-0. Almost simultaneously the 2-10-0 was developed. The firebox was made of steel rather than the rarer and more expensive copper. The firebox had three siphons and a combustion chamber. The rocking grate eased the task of the fireman, the grate bars were pretty close together which was good for Welsh coal but later proved troublesome with the lesser quality Dutch coal. The siphons and the combustion chamber contributed to a free steaming boiler. Although the 2-10-0 sports one more axle it does not produce more power because all essential power dimensions remained the same. The extra axle only served to spread the load and reduce the weight per axle for work on secondary lines. Two batches were built by the North British Locomotive Company, the first batch of 100 introduced in 1943/1944 and the second batch of 50 in 1945. 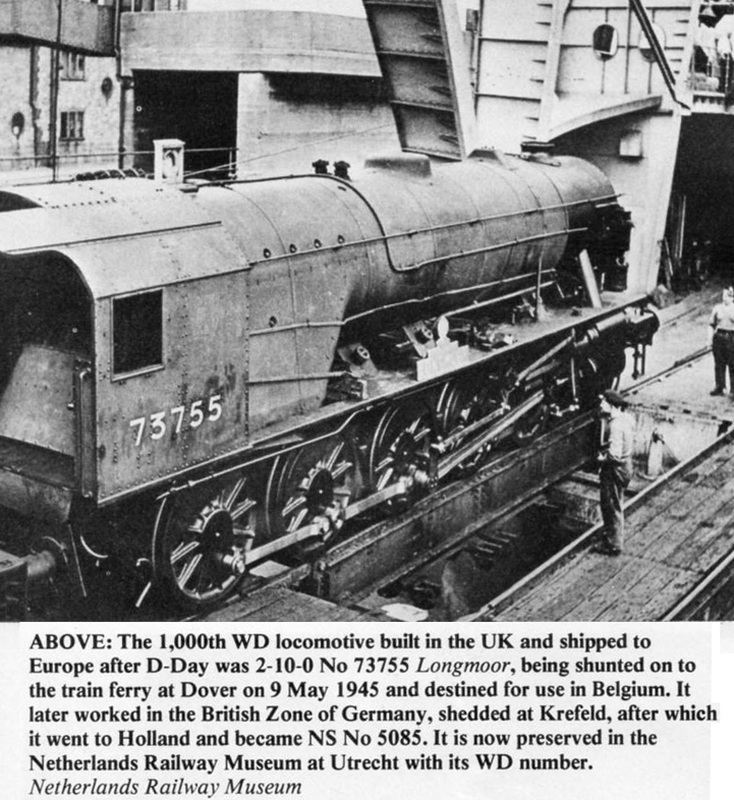 In the run up to the invasion many of the WD locos saw service in British soil to provide motive power for the surge in demand as a result of the war situation. During running-in of the WD 2-10-0s for instance the LNER received thirteen of the first batch, and twenty of the second batch on loan. Later LMS received the 79 of the first batch of 100 until they were needed in continental Europe in late 1944. The WD locomotives then followed the troops after the invasion, providing the much needed motive power to supply the moving front over the ever longer supply lines during the race to Berlin. Troop movements in the autumn of 1944. British troop had pushed far north, probably taking the WD locomotives with them. On 12 September 1944 American troops crossed the Dutch-Belgian border near Eijsden (a little south-east of the big A on the map). Maastricht was liberated on 14 September as the first large city of the Netherlands. British and Canadian troops took the more western parts of the southern border. The front quickly moved north and west. The failure of operation Market Garden (17-25 September) however meant that the Allied Forces did not capture a bridge to cross the Rhine near Arnhem and in the face of the winter the advance petered out below the big rivers in December. The east of the country was liberated no earlier than March 1945 by leaping over the east via Germany. The west of the country was liberated by the cessation of hostilities on 5 May 1945. The Austerity locomotives entered the Netherlands when the front moved over the southern parts of the country, "below the big rivers". To the best I could find the British troops entered the Netherlands on 22 September with the liberation of Weert (Suffolk Regiment) followed by the 53rd division of the 2nd British Army in late October 1945. On 27 October the British troops reached Tilburg. It is not likely that any WD loco saw service on Dutch soil before that date. I have found a statement that the first nine examples of the WD 2-10-0 came to the Netherlands in December 1944. In April 1945 their number had risen to 33, to fall again after the war had ended. They continued to serve British transportation needs until October 1945 when they were withdrawn as surplus to requirements to await their further fate. As they had no immediate purpose in the UK they were left on the continent, contrary to many 2-8-0 which were repatriated. Many were stored in Roosendaal and Antwerpen. Initially the Dutch Railways had little interest for the 2-10-0s as they were deemed too large, they could only be turned on a limited number of depots, and because they had no steam heating. In January 1946 a lease contract was signed for 60 locomotives, but logistical problems in Germany led to a lot of engine swapping. Eventually the NS acquired all remaining 2-10-0s on the European continent, among which the 1000th WD locomotive to reach the continent, no 73755 "Longmoor". They were now numbered 5001-5103. As the class 5000 had been used before it should be quite formally be named 5000II. Soon after acquisition the 5000s were Dutchified: they obtained the dark green and black livery, air brakes and an enclosed cab. The driver however remained on the left side. The black striping was not always applied although many are known to have received them. None of them ever carried the customary cast oval number plates. Numbers were always painted on the cab sides. Soon experimenting began with smoke deflectors as staffs complained about bad visibility. In the end the chimney was elongated, a measure that did their sleek appearance little good. The 2-10-0s were nicknamed the "Big Jeeps", to distinct them from the 2-8-0s, the "Small Jeeps". Another nickname was the "Shakers", because of the rocking grate. The 5000s worked for NS only for a relatively short time span. NS preferred the 2-8-0 because these locomotives were more compact yet delivering the same tractive effort. The steel firebox was also an issue as it needed a different approach to firing and more maintenance. As early as August 1948 the first three locomotives were withdrawn. As soon as the prewar plans for the abandonment of steam had been revised and re-affirmed, with a planning aiming for ultimately 1964*), things went quickly. In 1952 all was over. Many tenders dogged on however to replace the tired tenders of the 3700 class, smokebox doors were used as a stopgap to keep other classes afloat and a few boilers found an alternative job. One example, no NS 5085, ex-WD 73755, "Longmoor" was preserved and now resides at the National Railway Museum in Utrecht. *) In hindsight steam ended as early as December 1957. The preserved example in the Dutch railway museum. A few more 2-10-0s survive in the UK. These videos show the operational example at the North Norfolk Railway. I compared the WD 2-10-0 to its direct competitor the German BR 52. I also included its sister design WD 2-8-0 / NS 4300 and two peace time designs of the Dutch Railways. The result of the aforementioned calculation are congruent with the remarks I found that the BR 52 had almost twice as most tractive effort as the WD 2-10-0 / NS 5000. Although the WD 2-10-0 can stand the comparison with its direct adversary the BR 52 in most dimensions it is quite striking that the WD design barely delivered half the tractive effort of the BR 52. This is mainly caused by the far more generous cylinder diameter and the 30% higher boiler pressure of the BR 52. This is not entirely fair though as the class was designed for 15.8 kg/cm2 which reduced by the NS to 12 kg/cm2 to economise on boiler maintenance. I have included the calculated tractive effort for the higher boiler pressure in parenthesis.